Vargas had a rough day. He started rough, stayed rough and ended rough as he left after just three innings of work and giving up 5 runs. The M's faced ex-Mariner Brandon Morrow who was traded for Brandon League before last season. Morrow has a 7 - 4 record with Toronto and got the win yesterday. The Mariners started off being very typical Mariners, loading the bases in the first and no out, they managed to walk off the field and grab their gloves without getting one run across. It's been that kind of year for the M's this year. After being down by 5, the M's got on the board in the 4th with a 2RBI double by Josh Bard, but the Jays answered right back in the bottom of the inning with 3 runs of their own and two more in the 6th. Jays 10, M's 2. Top of seven, Brendan Ryan doubled and Dustin Ackley doubled him in, but once again, the Jays came back with a run in the bottom of the 7th. The rest of the game was all Mariners as they tried to scratch out enough runs for a win. Adam Kennedy hit a homerun in the 8th and Ackley hit a homerun in the 9th that scored Brendan Ryan. Final score however, Mariners 6, Blue Jays 11. Not much to be said about the game, Vargas had a rough day and the rest of the pitching staff followed suit. Giving up 11 runs is not something we have seen a lot of this year. 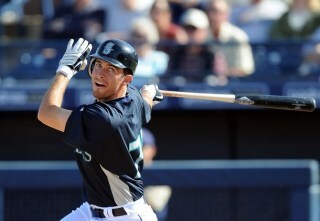 I will say that this Brendan Ryan - Dustin Ackley combo is really starting to gel in the top of the order. I think I like it. Let's hope we see more of what we saw today.